Buy 1 oz 2014 Freedom Girl Silver Rounds | ?? 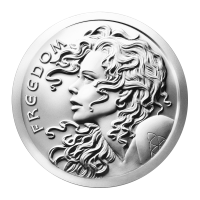 1盎司2014年自由女郎银圆 This is a re-release of remarkably popular Freedom Girl Silver Round. It is exactly the same image used on the original. The only difference is instead of the Silver Bullet Silver Shield logo on the other side it is the new Silver Shield logo. This coin is created on the basis of the Peace Dollar, which is regarded as one of the most beautiful coins in the world. The Peace Dollar was struck by the US mint after World War One, commemorating the "War to End All Wars" - 34 year old sculptor Anthony de Francisci used his wife Mary Teresa as a model for the coin. Men have been know to fight to the death for women, treasure and freedom, and Freedom Girl is a stunning combination of all three. Every aspect of the design brings out a gorgeous update of the classic Peace Dollar. The original Peace Dollar had her hair tied in a bun with an uncomfortable tiara perched on her head, while Freedom Girl's hair is wild and free. Freedom Girl's parted lips and ecstatic gaze looking forward to the future are so seductive, as Freedom should be. Even her shoulder arching forward brings out more emotion from this modern beauty. She is finished off with modern cues of a hoop earring and a tattoo of the Trivium. This round is made from 1 oz of 999 pure silver and is sure to make a great addition to any Silver Shield collection or as a gift for anyone who values beauty and meaning.